Spread word of your gathering faster than the Seattle Center Monorail can get from one station to the next! 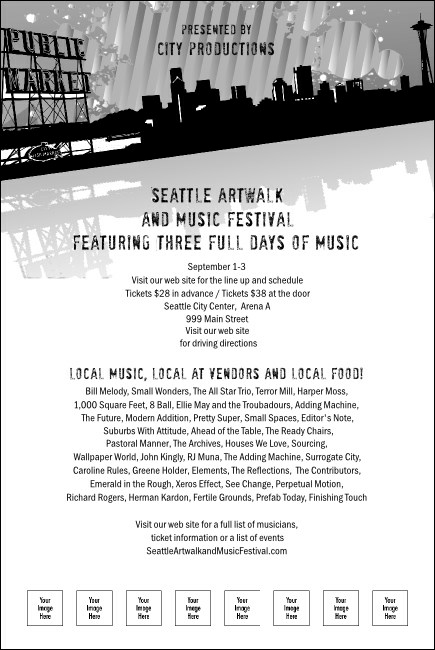 Designed with the Space Needle and city skyline as a background, this beautiful black and white Seattle Poster promotes your upcoming event in style with five spaces for custom image uploads. Next stop: fabulous designs! Check out more great options for Seattle hosted events at TicketPrinting.com!